Race/ethnicity: British all the way! Transformation phrase: Vampire Power, Make Up! Attack phrase: Vampire Order: Transcend Force! Weapon: The 30mm Anti-Midian Harkonnen Cannon. Exploding bullets included. Seras is the sweet, sensitive, young girl – “schoolgirl” to Alucard – who becomes a vampire in the town of Cheddar after the death of her father. With the help of a guiding hellhound, Alutimis, she battles vampires on her own for a while as “Sailor V” until she meets the rest of the Sailor Team. She’s very glad to meet them. She doesn’t do well on her own. Seras attaches herself to authority figures, most recently Integra. Her insecurities have only multiplied since becoming a vampire; she’s uncomfortable in her new form and worries about losing her humanity altogether. In battle, though, she wields her massive cannon with ease, which is helpful to say the least. 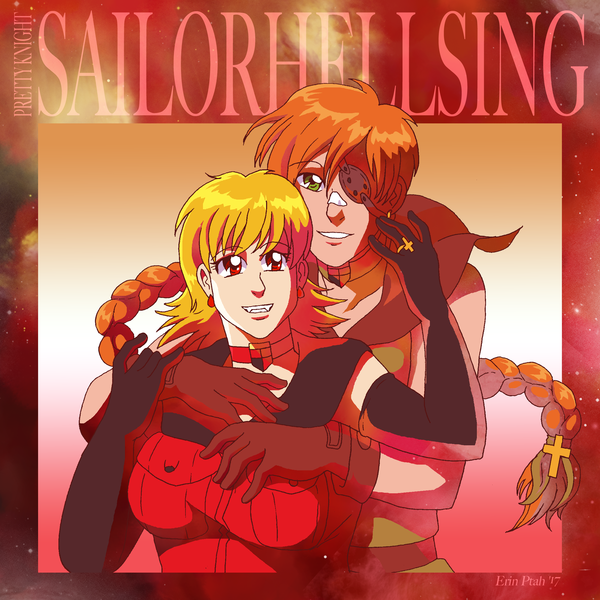 Eventually falls in love with Sailor Human. They’re very cute together. 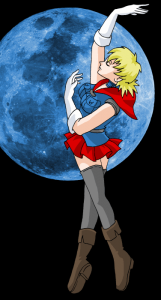 As Ultimate Sailor Vampire, she gets a new set of shadow-based powers, along with a double-wield rocket-launcher the size of a small car. Because there’s no such thing as overkill.